New Release Marks On-Year Anniversary of Controversial Killing of Baby Giraffe at Copenhagen Zoo. 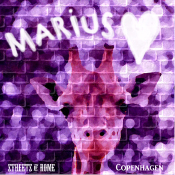 A new song released today on iTunes by STREETS OF ROME, a singer-songwriter band from Sonoma County, California, celebrates the short life of of Marius, a baby giraffe euthanized one year ago by the Copenhagen Zoo. Marius had just turned two years old when zoo authorities decided the giraffe’s DNA were not unique enough to justify further life or the prospect of future breeding. Marius was killed by a shot from a bolt gun on February 9th, 2014, dissected in front of children and adults visiting the zoo that day, and then fed to lions – also on full display to the public. Protests were lodged from around the world prior to Marius’s killing, and numerous other zoos offered to take Marius and spare his life. Animal rights organizations also objected to the killing of Marius. Tragically, the Copenhagen Zoo ignored these pleas and carried out the execution as planned. “Copenhagen” by STREETS OF ROME is a one-song mini-musical in six short parts centering on the fate of Marius, but also touching on other themes of dignity and the sanctity of life – serious issues handled with a light touch – in Streets Of Rome’s unique style. Copenhagen, co-written by Edward Patrick Mooney and Ana Luisa Anzore, was recorded at Bluestone Recording in Petaluma, California. The song debuted worldwide during a live interview with Edward Patrick Mooney in New York City Tuesday February 9th, 2015 on Sirius XM Satellite Radio’s “Busted Halo” Show on the Catholic Channel.